Use this pendant as a tool to align the energies of the bodily chakras and bring them into an equal alignment. You may work with the pendant consciously, or receive passive healing just from wearing it. 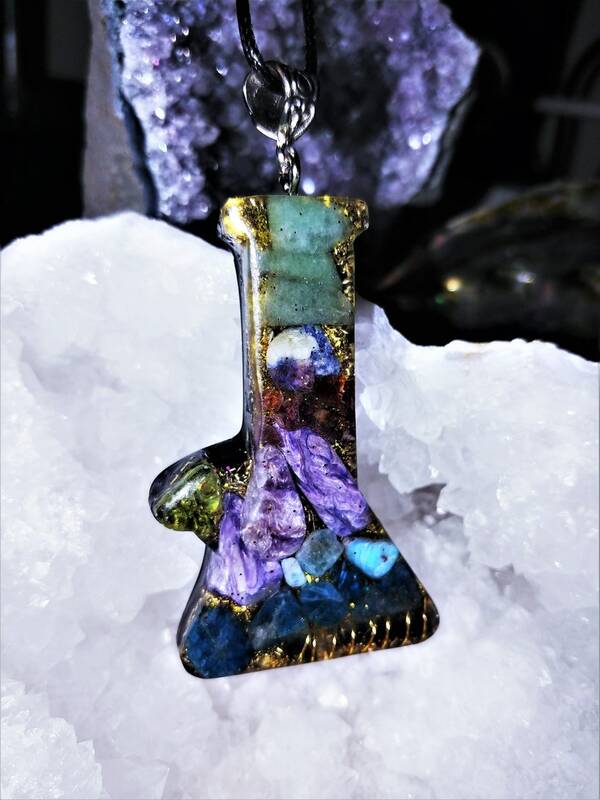 It contains Charoite, Green Aventurine, Blue Apatite, Moss Agate, Sodalite, Peridot, Shungite powder, Pyrite sand, clear quartz crystal wrapped in copper wire, copper coils, mica, 24 k gold leaf, tesla coil, red copper coils metal shavings, Reiki healing energy, Love and Light, 528 Hz frequency. Peridot is associated with the heart chakra, and can be used to balance and stimulate it. It is a stone of compassion. It has a friendly energy and is excellent for healing. It assists in rebirth and renewal of all kinds. Peridot also bring abundance and prosperity and happiness. It enhances the healing and harmony of relationships of all kinds, but particularly marriage. Peridot is used in crystal healing to lessen stress, especially in relationships, anger and jealousy, slow aging, and heal ulcers and digestive problems. . It may increase confidence and assertiveness, balanced by patience and clarity of thought. These lovely lime-green stones are birthstones for August, September and October, and make beautiful precious jewelry. The green color is caused by its iron content. It is an important stone to use for cellular rejuvenation, and to help the problems associated with aging. It has been said to make a shield of protection around the body of any wearer of peridot. Sodalite is a stone of logic, rationality, and efficiency. It is helpful for work in groups and stimulates thought. Sodalite is a stone that is good for healing breaches in communication. It is a stone of truth, and brings this to all communications. It is called a Poet's Stone. It can help end arguments or other disagreements. It is particularly useful for honesty of emotions and love. It increases intelligence, knowledge and learning, and can unite the logical with the spiritual. Aventurine is said to benefit one in all areas of creativity, and imagination, as well as intellect and mental clarity. Lore says that it enhances prosperity and brings career success. It is a gentle stone energetically that gives a sense of calm and balance and enhances happiness. It also helps one to see alternatives and potentials in all situations, giving a positive outlook, courage and inner strength. It is also said to bring luck, especially in games of chance. Green aventurine is also a mystical stone of prosperity. Aventurine bring friendship to one's life. It is also a stone of protection energies. Folklore and metaphysical lore say that physically it is beneficial for blood, circulatory system, balancing blood pressure, sinus problems, nausea, headaches, general health, allergies, eczema, fever, and sleep disorders. Note that healing crystal meanings are spiritual supports to healing and are not prescriptions or healthcare information. Aventurine is associated with the heart chakra. Extremely popular metaphysically, Clear Quartz is the most versatile healing stone among all crystals. Quartz is the most powerful healing stone of the mineral kingdom, able to work on any condition. Clear Quartz is known as the stone of power and amplifies any energy or intention. Clear Quartz protects against negativity, attunes to your higher self, and relieves pain. Clear Quartz has been shown to enhance and strengthen the aura. Clear Quartz comes to us with information for the higher self to assimilate in the process of one's spiritual growth. It is often used to cleanse, open, activate, and align all of the chakras. In natural form, Clear Quartz Points radiate their energies outward, into the surrounding environment. Clear Quartz can be programmed with intention and kept in a central place to emit its helpful energies. Quartz Points naturally form in a 6-sided (hexagon) shape. The Sacred Geometry of a 6-sided Clear Quartz Point contributes to its ability to magnify energetic vibrations.